What level were you when you acquired Thief? I got absolutely murdilated trying to get away with it. I don't remember the exact level, but I think it was between 10 and 15? It helps to have a companion as a meat shield and to keep in mind that Dungeon Hero X's beam attack is three spaces wide, takes a few turns to charge up, and is always fired in the direction he's facing. Also if you have them, haste drinks, warp wings, a well-honed talon and saddle set, and using a phoenix down or pepio flower for the reraise effect before stealing (and having backups in case you die) can give you exactly the edge you might need to get to the stairs. Dungeon Hero X is powerful adversary, but not that powerful. Ah, so the idea is to run, not stand and fight. Got it. Leviathan was rough. I almost didn't win because my white mage healing couldn't keep up with his rude stuns. And then I kicked a veggie in his face and he fell over. Word of warning to anyone who wants to go digital for the Switch port of FFX/X-2 and is concerned about fridge space, the eShop description is misleading; it’s twelve GB per game. The actual download is a little over 26 GB. I have a shocking statement to make, that may alarm some of you. Final Fantasy 7 is extremely good. I'm playing using the Beacause retranslation patch. It changes names and items and stuff I would have rather stayed the same, but the context for virtually everything is soooooo much clearer. For instance, Did You Know: the section of vents and such you climb through on your way to Reactor 5 is actually the interior of one of Midgar's plates? Really small exchanges virtually everywhere in the game make SO MUCH more sense and have so much more context. Last edited by LancerECNM; 04-15-2019 at 04:39 AM. 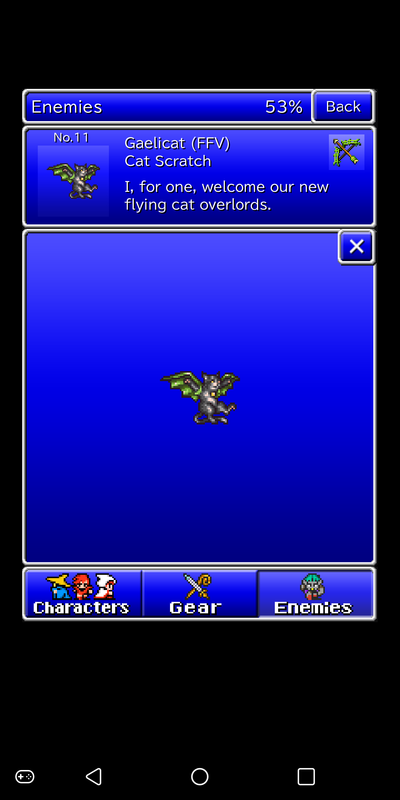 I know it's just a game about rubbing the screen to make the little people attack things, but Final Fantasy: All The Bravest has some pretty great* description text. * Usually, anyway. Gonna talk about this a li'l bit under the spoilerpop. Also the description for the quicksilver gun made me very uncomfortable in a different way. "This easy-to-use gun practically shoots itself. Killing has never been so simple!" Last edited by MetManMas; 04-14-2019 at 01:41 AM. it's so good to play this in a post-Kazuko Shibuya awareness world. Putting a good name to great sprite art and U.I. design is such a treat in finding new angles in interacting with things otherwise well explored. I'm not that experienced with the game (this was my second playthrough to the end), but it's still surprising how relaxing and lacking in any kind of stress the act of playing the game is. I'm certainly more aware and learned in the genre than I was close to a decade ago when I played this first, but it's also in due thanks to a shift in mentality. 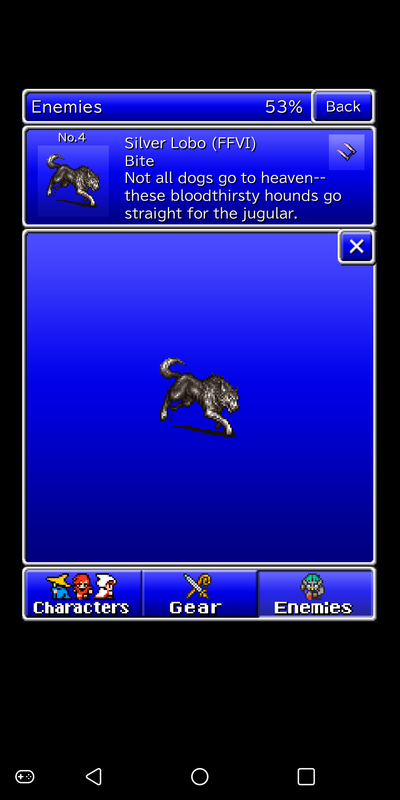 More archaic RPGs can seem hostile to some but within that context Final Fantasy is downright streamlined. The FIEND's ball cracks open... An ominous cloud rises, and an evil shape congeals... It is LICH, the FIEND of Earth. Once the ORBS shined with the power of Earth, Wind, Fire and Water. The four FIENDS seized those Powers. Lightning erupts from the FIEND's ball... So, you have come this far... I, TIAMAT the FIEND of the Wind will now put an end to your adventure!! The FIEND's ball is shattered, evaporating all the water. Ho, Ho, Ho... How foolhardy to dare challenge me, KRAKEN the FIEND of the Water. Is it you, the tinder that defeated the FIEND of the Earth, and disturbed my sleep? I, KARY will now show you the force of Fire, and you shall burn in its flames!! With the four ORBS shining again the Time Gate can be broken. The true enemy is 2000 years in the past. A friend made the remark that if given consistent exclamation, Final Fantasy would read like a Jack Kirby comic, which I thought was very salient in summarizing the appeal. I love that there are bats just fluttering about in the dungeons, as present as NPCs are in towns. The end-game reveal relating to the ones in the Chaos Shrine is great, but it doesn't account for all the ones populating the rest of the world's dark corners. It gives the dungeons more character when there's visible activity in them outside of the battles too. I was the true LIGHT WARRIOR all along. May the ORBS always shine!! Mobius Final Fantasy has amazing music. Never don't capitalize "ORBS." NORG. 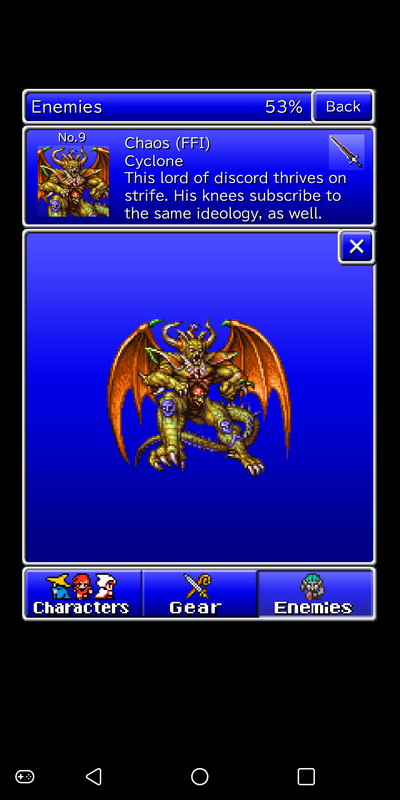 There's tons of music from other FF games in it too when they do crossover events/jobs, that I'm sure you've all heard of before. But something I always thought was cool was that during their FF7 collab, they used music from the not-yet-released version of the FF7 remake. Isn't this just from Advent Children? On the other hand, looking for picks for the Thunderdome last week I realized that at least when the remake finally exists we'll get new arrangements of the FFVII soundtrack not in that embarrassing PS1 sound font. 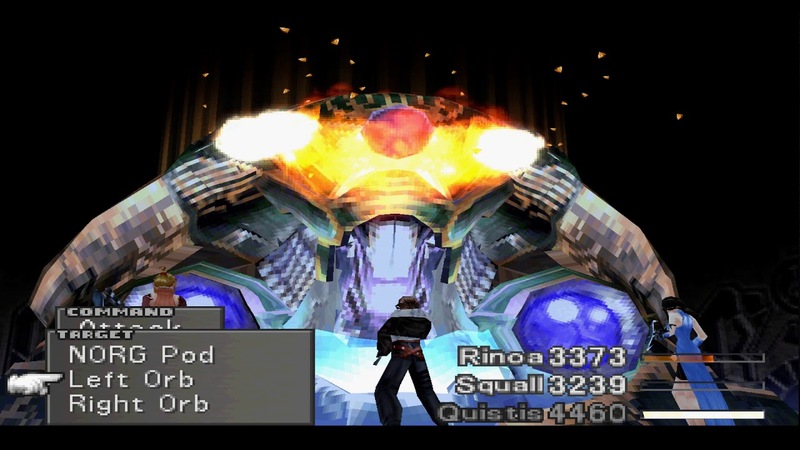 The instrumentation in Final Fantasy VII is excellent and a core component of the game's aesthetic and atmosphere. Some tracks use it better than others, but the ones that use it well use it really well. Yeah, there are some really great tracks even in the OST. But I considered nominating Cid's Theme for the Thunderdome until I found a recording and... just no. Yeah, within the context of playing FFVII even the tracks with really weak instrumentation work really well. But I like to listen to video game music on its own pretty often, and in that context it's not nearly as good. Yeah, I think it's great regardless of context. It's very pleasingly liminal in ways that complement the rest of the game and its place in the series. Nothing else by Uematsu really sounds like it. Uematsu's Front Mission Gun Hazard score sounds just like it. Anyone who specifically enjoys FFVII's instrumentation owes themselves a listen to that. Gun Hazard has many compositional tells and calling cards he employed in that period, but I think they're still very distinct works thanks to the hardware involved and however that affected the process. FFVII's MIDI sound is very particular. What’s the difference between the regular and Expert sphere grids in FFX? The only thing the game told me is that I was stuck with my choice once I made it. It's a lot easier to get characters on different paths than their default one in the Expert Sphere grid. That said, part of that is because there are fewer stat upgrades on it, so it will eventually make the game harder, especially very late game. For a casual playthrough that doesn't go for the post-game stuff, either one will see you through to the end. It's more complicated than it seems, but long story short, this isn't true. Both let you max stats. basically boils down to - if you want to make Tidus a White Mage and Lulu a Knight before the endgame, use the Expert grid. And that's it. It's easier to max out the Normal grid, but eventually you can get all your characters maxed out in both. If you've played before, give Expert a spin. It's not a dramatic departure from the Filthy Casual sphere grid; it just gives more opportunities to reclass.